This video demonstrates motion planning and reactive obstacle avoidance for nonholonomic robots. 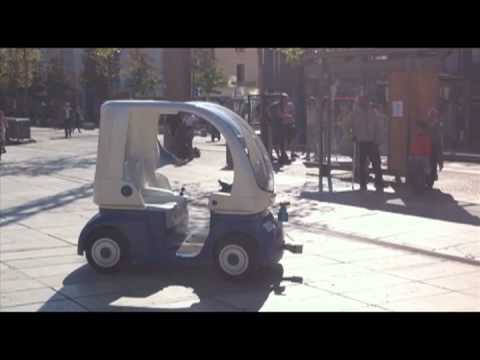 A mobile robot with a trailer is asked to park into a U-shaped obstacle. Motion planning is performed by a visibility-based PRM algorithm using a flatness-based steering method built on convex combinations of canonical curves. The planned trajectory is then followed by the robot while detecting obstacles using a laser scanner. The current trajectory is locally deformed in order to avoid obstacles and to end at the detected U-shaped obstacle. 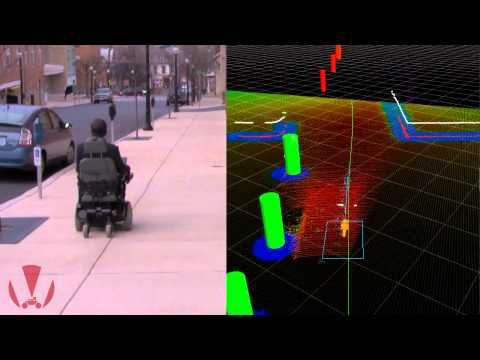 This experiment demonstrates how a reactive navigation method successfully enables our robotic wheelchair SENA to navigate reliably in the entrance of our building at the University of Malaga (Spain). The robot navigates autonomously amidst dozens of students while avoiding collisions. The method is based on a space transformation, which simplifies finding collision-free movements in real-time despite the arbitrarily complex shape of the robot and its kinematic restrictions. For people with extreme disabilities such as ALS or quadriplegia, it is often hard to move about on their own and interact with their environments due to their immobility. Our work - nicknamed "Project Chiron" - attempts to alleviate some of this immobility with a kit that can be used on any Permobil-brand wheelchair. The maturity of the tools developed for mobile-robot navigation and explained in this chapter have enabled Google to integrate them into an experimental vehicle. This video demonstrates Google's self-driving technology on the road. We present a mobile-robot navigation system guided by a novel vision-based, road-recognition approach. The system represents the road as a set of lines extrapolated from the detected image contour segments. These lines enable the robot to maintain its heading by centering the vanishing point in its field of view, and to correct the long-term drift from its original lateral position. 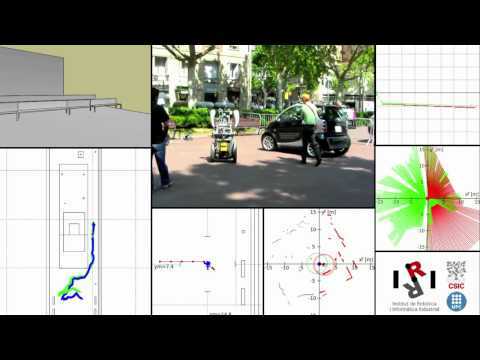 We integrate odometry and our visual, road-recognition system into a grid-based local map which estimates the robot pose as well as its surroundings to generate a movement path. Our road recognition system is able to estimate the road center on a standard dataset with 25 076 images to within 11.42 cm (with respect to roads that are at least 3 m wide). It outperforms three other state-of-the-art systems. 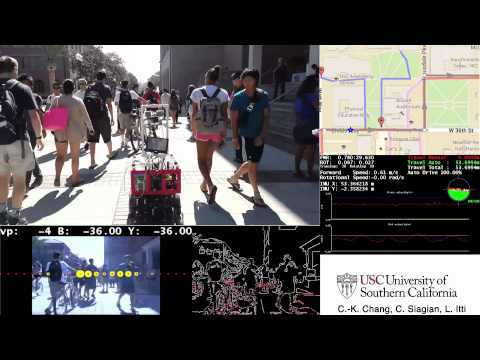 In addition, we extensively test our navigation system in four busy campus environments using a wheeled robot. Our tests cover more than 5 km of autonomous driving on a busy college campus without failure. This demonstrates the robustness of the proposed approach to handle challenges including occlusion by pedestrians, non-standard complex road markings and shapes, shadows, and miscellaneous obstacle objects. 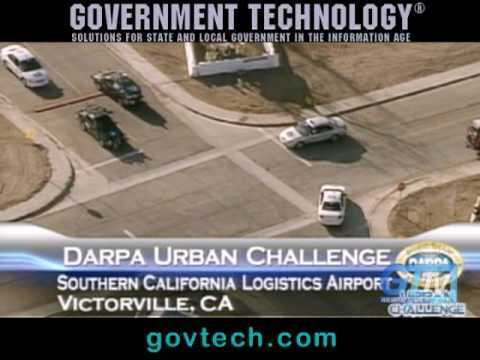 In order to forster research and development in the domain of autonomous navigation, the DARPA agency organized a challenge in 2007 for competitors to develop autonomous vehicles which are able to follow an itinerary through an urban environment. Navigation within unstructured areas like parking lots made extensive use of RRT-like methods.